Out in the wilds, you have a limited amount of tools in your arsenal. Don’t you want to be carrying the best possible scope? To help make your next hunt a success, we’ve decided to do an incredibly comprehensive Bushnell TRS-25 review. There’s been a lot of hype over this Red Dot scope – rumors of its compact, reliable, and sturdy nature. Let’s see if the Bushnell Trophy TRS-25 Red Dot Sight Riflescope can live up to the company’s legacy. As an American sporting optics company, they place their specialization in outdoor products. As an example, this includes telescopes, binoculars, night vision equipment, and of course their phenomenal rifle scopes. The company was established in 1948 after the founder David P. Bushnell returned to California after his honeymoon in Japan. David came back with two crates of binoculars in hopes of selling them by mail order. This became the first times middle-class Americans could buy affordable optics thanks to importing goods. Since 1948, they have strived for easy, precise, and affordable optics, moving to a huge variety of optical goods. Yet, with how renowned the company name is, we’re sure the TRS-25 is only just the beginning of their refined optical technology. What features does the Bushnell Trophy TRS-25 Red Dot Sight Riflescope have? Designed to keep your rifles, shotguns, and handguns in line, the Bushnell TRS-25 is a lightweight and durable model. Also, the scope’s peak accuracy is everything you’ll ever need for quick and simple target acquisition. The 1×25 red dot has been engineered for better, brighter multicoated optics. This can help the hunter to quickly distinguish between a deer and what’s actually just…a log. This is perfect for any instances of low-light conditions. Also, it’s fog proof, waterproof, and shockproof! The red dot sight itself can be easily observed with both of the hunter’s eyes open. The scope has an unlimited amount of eye relief, allowing for a greater sense of awareness. Not only that, the sight’s parallax-free design allows for full-movement while retaining the ease of targeting. However, what we’re most impressed by is the scope’s size. The Bushnell Trophy TRS-25 allows the user for a completely full-sized performance. Plus, it’s not often that you’re looking to replace the battery. So, what else makes the Bushnell Trophy TRS-25 great? 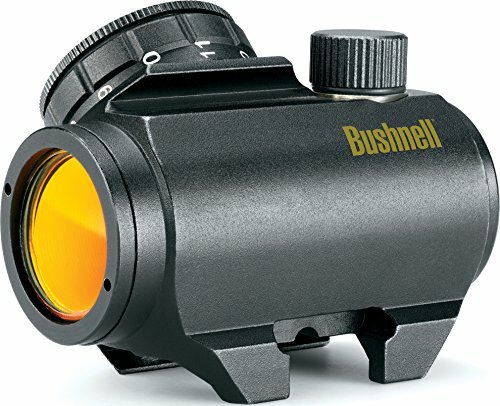 What are the Pros of the Bushnell TRS-25? With a myriad of scopes to choose from out on the market, the Bushnell TRS-25 has earned Amazon’s label of being a #1 Best Seller in Gun Sights. The positioning of the Red Dot Lens is off-axis, allowing for a more accurate shot than traditional riflescopes lack. Incredibly low and affordable price point compared to its competitors for a Red Dot scope. Resistance-designed control knob ensures that the scope does not accidentally turn on during travel. Sports an amber-bright high contrast type of lens thanks to its innovative tinting. Built to withstand abuse and great for a variety of environments due to its shockproof construction. Unlimited eye relief for heavy-duty guns is a shooter’s saving grace. Extended battery life will allow shooting all day long. As you can see, there are tons of positive reasons to try out the Bushnell TRS-25 scope, but there are a few disadvantages as well. What are the Cons of the Bushnell TRS-25? If you can’t take the good with the bad, you may as well get off the shooting range. Here’s Bushnell’s TRS-25’s potential disadvantages. Viewing the red dot reticle in a high light intensity environment makes the sight appear blurry but lowering the intensity of illuminated light resolves the issue. Indoor settings can be difficult for lighting adjustments, but Bushnell addresses that in their user manual. If the scope seems impossible to zero, check the alignment of the mount to the barrel – a faulty adjustment screw or unstable impact point to blame. Even with the listed cons, Bushnell has already prepared for problem-solving and troubleshooting for their customers. At Bushnell, they take great pride in helping their customers and have phenomenal customer service. If you’re as impressed over the Bushnell TRS-25 as we are, you won’t want to hesitate towards the opportunity to try the scope out yourself! With the limited cons, great price point, and superior quality there’s not much more a beginner hunter could ask for. Just do yourself a favor and give the Bushnell TRS-25 scope a try! You can also see the best Remington 700 scopes. If you are interested in a scope that is useful even at night, see here.